If you require any more information or have any questions about this copyright, please feel free to contact us. All the information on this blog is published in good faith and for general information purpose only. Every user on this blog agrees to 101Helper's Copyright policy. According to 101Helper's copyright policy every link, text, gadgets and tools on this blog is owned by 101Helper. Nobody is allowed to copy a single word of this blog. 101Helper's content is checked every month and if copied or in case of any violation the person/blog(which have copied content) is reported to Google immediately and if it is detected that the blog(which have copied content) is monetizing Google Adsense ads using our content will be reported to Google for monetizing Google Adsense ads on copied content as a result Adsense account will be banned and content which is copied will be deleted shortly. (1). Nobody is allowed to copy anything without permission of Admin(Fahim Raza). Click here to get permission. (2). Any thing copied from this blog must be copied for educational purpose. (4). 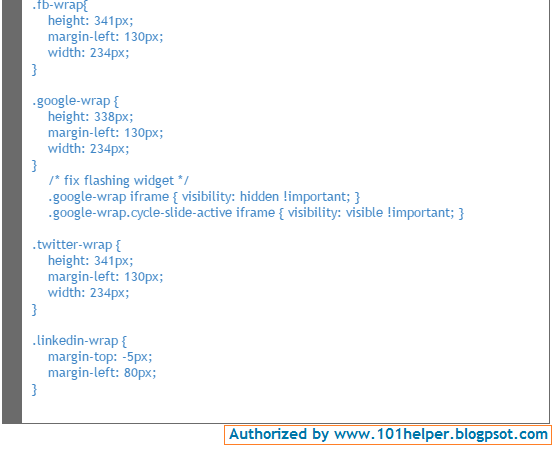 Nobody is allowed to modify any gadget/widget and use it is his blog without 101Helper authorization tag. (5). Nobody is allowed to copy whole articles of this blog. This Copyright policy can be updated anytime by Admin.